Our teams are gearing up to hit the road. 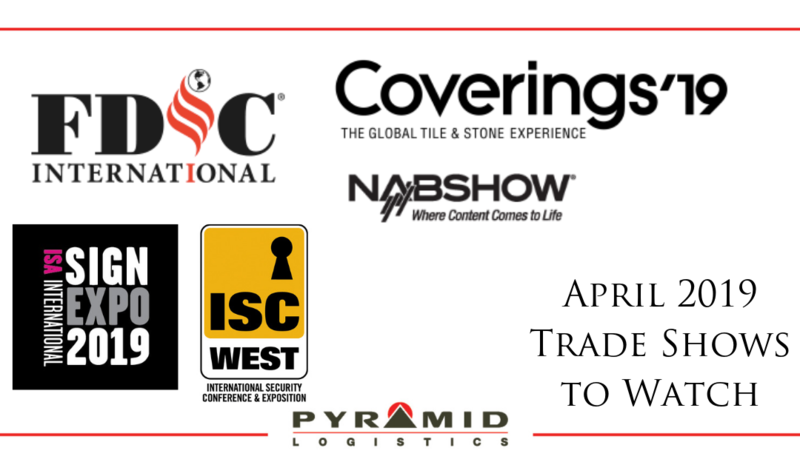 It’s a busy April in the Trade Show world, and there are several shows that we will be assisting partners in their transportation and logistics needs. Pyramid Logistics is an industry leader in transportation, logistics, warehousing, and experiential marketing. As your marketing team works with designers to craft the perfect booth, we put together the blueprint to warehouse, transport and unload your materials at Trade Shows around the country. International Security Conference and Exhibition or ISC West: This is the largest converged security trade show in the country. Everything from drone technology and biometrics to robotics and smart home, the future in security and surveillance can be found here. The show runs at the Sands Expo in Las Vegas from April 9 through April 12. If you are networking with the event, you can use the #ISCWEST hashtag. International Sign Association’s ISA Sign Expo: Last but certainly not least is ISA Sign Expo. For more than 70 years, leaders in the graphics, signage, print and visual communications have attended this event. This year’s event runs April 24 through 26 and will be held at the Mandalay Bay Convention Center. If you want to see what’s happening in the world of communications, use the hashtag #SignExpo and have a conversation with attendees. We are excited to be working with partners at these shows. Are you considering entering the world of trade show marketing, and you need a strategy for the transportation of your goods? Connect with us here. We will be watching our partners at these events and networking with them and other vendors and exhibitors on Twitter. Are we connected? Follow us @PyramidLogistic on Twitter.